Drawn by Robert K Dawson of the Royal Engineers and published for the Boundaries Commission probably in 1832 as part of the work around the Great Reform Act. Original hand colouring. Reasonable to good condition. The "Pictorial World" map of Surrey. A 19th century lithographed map with original colouring. Topographical notes and population statistics etc are printed verso. 16" x 13" (410mm x 335mm) map area only with margins beyond. SURREY BY JOHN CARY c1809. JOHN CARY c1809. PUBLISHED JULY 1st 1809 BY J. CARY. VERY DETAILED CO PPER ENGRAVED MAP WITH HAND COLOUR. 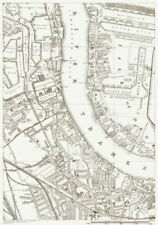 THIS ENGRAVED MAP IS IN EXCELLENT CONDITION WITH A GOOD CLEAR IMPRESSION & HAND COLOURING. Map of Surrey. st, 1831. Hand Coloured Engraved Map. London: Chapman & Hall. London: Chapman & Hall, Nov. 1. Publication Date: 1831. Colour, black and white with coloured borders. Engraved by S Hall. This is an original antique map taken from a disbound copy of Lewis' Topographical Dictionary published in 1845. 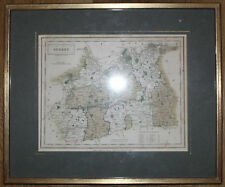 A Really lovely unique piece, it is an original antique map not a modern reproduction so is over 170 years old! GEORGE WASHINGTON BACON c1881. SURREY BY GEORGE WASINGTON BACON. GEORGE WASHINGTON BACON WAS BORN IN NEW YORK IN 1831. 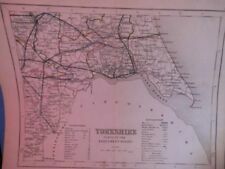 A DETAILED LITHOGRAPHIC MAP WITH ORIGINAL HAND COLOUR WASH. THIS LARGE MAP IS IN GOOD CONDITION WITH JUST A SMALL FOXING SPOT TO THE TOP LEFT. JOHN CARY c1824. SECTION SHOWING ARUNDEL, BRIGHTON, HORSHAM, GUILFORD, AND GODALMING. SURREY AND SUSSEX BY JOHN CARY. SURREY AND SUSSEX. "CARY'S NEW MAP OF ENGLAND AND WALES with part of SCOTLAND". A VERY DETAILED COPPER ENGRAVED MAP WITH ORIGINAL HAND COLOUR. Published by John Murray, London c1885. 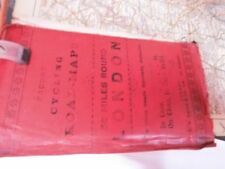 A 19th century lithographed folding map with original colouring. A previous owner has dated the map in pencil on the verso as 1888. 16" x 13" (410mm x 335mm) map area only with margins beyond. An attractive county map of Surrey with original hand colouring. Dated in the plate. Published by T.L.Murray, London 1830. 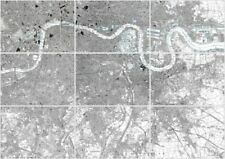 17.5" x 14" (450mm x 355mm) map area only with margins beyond. Free of repairs or restoration. Title / Subject: Surry. North is oriented to the right of the sheet. Including Dorking, Reigate, Leatherhead. Coverage is much of the eastern half of Surrey. Reigate and Redhill are in the centre of the map and other towns covered include Dorking and Leatherhead. On the reverse is an extract from Surrey Sheet 27.14 showing Bletchingley (or Blechingley) in detail, with a directory. PROVENANCE: Published in The Encyclopaedia Britannica. Ninth edition, 1885. Originally published by A & C. Black. There were a number of editions with minor tweaks until c.1899 and further poor quality 'pirate' editions issued in the United States between 1885 and 1896. 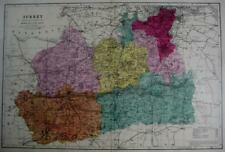 A good sized 19th century lithographed map of Surrey with emphasis on the railway network. The original colouring is decorative and eye catching. by B.R. Davies. Published by G.W.Bacon, London 1870. A fine county map of Surrey with original outline hand colouring. With a scale of statute miles and a reference to the Hundreds. Dated (1788) and credited to Harrison in the plate. The quality and high level of detail can be appreciated in the close up images. A highly detailed, lithographed map with outline hand colouring ,of the county of Surrey which includes London. The detail includes, railways, both in use and unfinished. SURREY by B.R.DAVIES FROM HIS ENVIRONS OF LONDON & THE LATEST ORDNANCE SURVEY. SURREY REDUCED FROM THE ORDNANCE SURVEY DIVIDED INTO 5 MILE SQUARES. 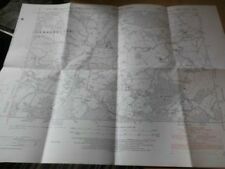 A highly detailed, large scale ( divided into 5 mile squares) lithographed map of the county of Surrey which includes London. The detail includes a reference to the Divisions & Boroughs, railways, stations and topographical relief. THE BRITISH GAZETTEER. A highly detailed, nineteenth-century map of Surrey. Lower right is an explanatory key and a reference to the Hundreds. We do not deal in reproductions, facsimiles or modern copies of any kind. "Hobson's Fox - Hunting Atlas.". 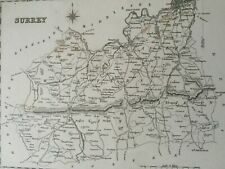 An attractive and decorative, antique county map of Surrey, extending from central & south London, to Farnham, Chertsey & Englefield. Published by J & C Walker, London 1893 for.